This tutorial will show you how to use Lazy Nezumi Pro's various smoothing options to get better looking lines. Whether you are doing a quick sketch, or working on meticulous line art, you will be able to find settings that will complement your style, and help you work faster. While experimenting with the settings, you can create a new empty preset via the Presets/New menu. Then click on the + button next to the preset list to expand the UI and see all the different sections. Lazy Nezumi Pro works with a mouse or a graphics tablet, but for best results, using a tablet is recommended. A tablet pen is pressure sensitive, which allows you to control the thickness and/or opacity of your lines. You cannot do this with a mouse. Mice are also a lot less precise, so you will likely have to increase the smoothing amounts to get good results. If you don't feel like diving into all the settings, feel free to use one of the Smoothing presets that come installed with Lazy Nezumi Pro. The Subtle, Massive, and Pulled String presets are great starting points for most people. If you want to know how to fine tune the program to get the most out of it, read on! The first mode option in the Position Smoothing section is called Pulled String. This mode is great for slow, detailed line work. It makes your brush behave like if it was attached to a piece of string that you can pull around. You can control how long the string is via the String Length parameter slider. The longer the string, the less sensitive your brush stroke will be to digital jitter and shakiness of your hand. The brush will only move when the string is fully extended, which makes it easy to draw sharp corners. Note that with this mode, the line ends as soon as you lift your pen. The second mode option in the Position Smoothing section is called Moving Average. 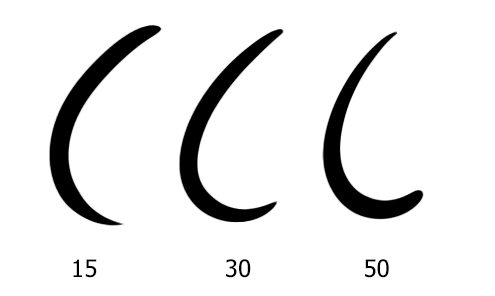 This mode smoothes your line by continuously averaging your previous pen positions, which makes it great for curvy lines with rounded corners. You will want to adjust the Amount parameter to your preference. A higher amount will produce smoother lines, but will also increase brush lag. When you select this mode, a Catch Up checkbox will appear. When Catch Up is OFF, your brush will only move when you move your pen. This can be useful when you are drawing slowly and need total control. When Catch Up is ON, your brush will catch up to your pen position when you stop, and at the end of your stroke when you lift your pen. 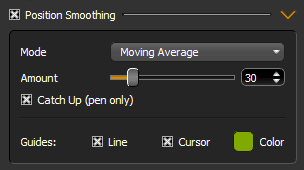 This option should be used for faster drawing. 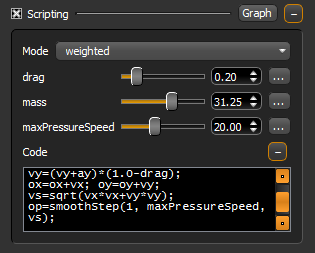 Another thing to note about Catch Up: when it's ON, your line endings will change depending on how much Pressure Smoothing you use (controlled via the Moving Average or Exponential Moving Average mode of the Pressure Processing section of the preset). Before experimenting with this setting, make sure that you have mapped pen pressure to brush size or opacity in your art software, or you won't notice any effect. If there is more position smoothing than pressure smoothing, your line will end in a sharp point, but will not fully reach the pen lift position. If both amounts are about the same, your line will end in a sharp point at the pen lift position. If there is more pressure smoothing than position smoothing, your line will end at the pen lift position, but not in a sharp point. The following image illustrates this. All three lines were drawn from top to bottom using the same hand movement, with the position smoothing amount set to 30. The number underneath each line is the pressure smoothing amount used. Generally, if you want your lines to look balanced, you should use the same amount for both position and pressure smoothing. The third mode option in the Position Smoothing section is called Exponential Moving Average. This mode is similar to Moving Average, but gives more importance to recent samples when computing the average. This results in a slightly different feel while drawing. The most notable difference is that curves will straighten out a lot faster while the line is catching up. This can provide better control for lines that need to be mostly straight with tight curves. The Smoothing - Weighted preset uses a custom script instead of the Position Smoothing section. This started out as an experiment, and it turned out to be really popular for calligraphy, so it will probably get moved into the Position Smoothing section in a future update! This script smoothes your lines by giving your brush a mass, and applying a force to it based on how far away the pen is from it. The drag parameter affects the momentum of the brush. By adjusting the parameters, it's possible to obtain auto-rotation and other gravity-like effects which can be a lot of fun! Another special property of this preset is that the output pressure is computed directly based on how fast the brush is moving. The maxPressureSpeed parameter sets the speed at which the maximum pressure will be output, so try lowering the value if you aren't drawing fast enough and are getting very thin lines.